This traditional styled swivel chair is the perfect reclining amenity to add to your casual or traditionally styled living room furniture collection. A relaxation piece that is made in the style of ageless furniture trends, this living room recliner is decorated with nail head accents and welt cord trim. Plush, plump pillows cover the seat and back, giving you a long lasting comfort, with contoured seat cushions for shoulder, neck and lower back support. With a built-in swivel component for easy movement, this chair works well in family rooms and formal living settings with an emphasis on guests and family conversation. 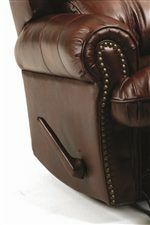 The Hancock Traditional Styled Swivel Recliner by Lane at AHFA in the area. Product availability may vary. Contact us for the most current availability on this product. Frame Construction All hardwood components are made from kiln-dried lumber, double-doweled, glued, corner-blocked, and incorporate 8-guage steel action brace construction. Padding & Ergonomics Custom made polyurethane padding in seats, backs, arms and ottomans for maximum comfort. Seat Support 8-guage steel springs attached to a sturdy hardwood/plywood frame with special lined clips for noise-free, lifetime easy seating. Hancock offers a traditional pub back recliners with first class comfort with traditional style. Slightly winged sides, nail head trim, deluxe welt treatment, roll arms, and a two tier waterfall back give you the ultimate style and comfort with the Hancock collection. Available in select fabrics and leathers, you can be sure this recliner will fit into your decor. The Hancock collection is a great option if you are looking for furniture in the area.